Graduation 2016: What is Appropriate to Spend on a Gift? The National Retail Federation does not rank Graduation among the major consumer holidays. According to the NRF, Americans will spend $5.4 billion this year on graduation gifts for high school and college graduates. That total ranks above only St. Patrick’s Day and below Halloween and even Super Bowl spending. Our new Affluent Investor Pulse survey polled Affluent investors about who in their circles is most likely to get a graduation gift and how much they will spend on that gift. Members of the immediate family take top priority for Affluent graduation gift-givers, followed by close friends and extended family members. One-fourth indicates it is important to reciprocate gifts to anyone who invites them to a graduation party. Women, more than men, feel it is important to bestow a graduation gift on close friends (55 percent vs. 47 percent) and to anyone who invites them to a graduation party (31 percent vs. 20 percent). Similarly, across the generations, Gen Xers ages 41-50 are the most likely to consider it important to give graduation gifts to close friends and anyone who invites them to a graduation party. Graduates may hope that their parents’ friends are Republicans. Affluent respondents who identify their political affiliation as with the GOP are more likely than their Democrat or Independent counterparts to state it is important to give a graduation gift to close friends (53 percent vs. 49 percent and 47 percent, respectively). Now comes the big question: How much is appropriate to spend on a graduation gift? The largest percentages of Affluent respondents indicate that a reasonable price range is $50-$100 for high school graduates (43 percent) and college graduates (32 percent). But they are more likely to shell out more for gifts for the college grad, Just over one-fourth (26 percent) believe $100-$150 is an appropriate amount to spend on a gift for a college graduate, compared to 21 percent who believe that to be appropriate amount for a gift for a high school graduate. 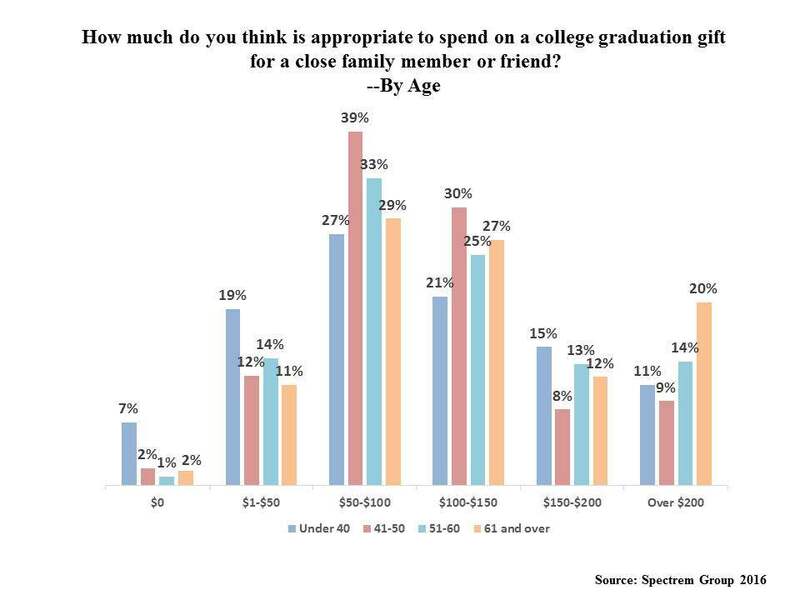 Sixteen percent think that over $200 is appropriate to spend on a gift for a college graduate; only 5 percent would spend that much on a high school graduation gift.